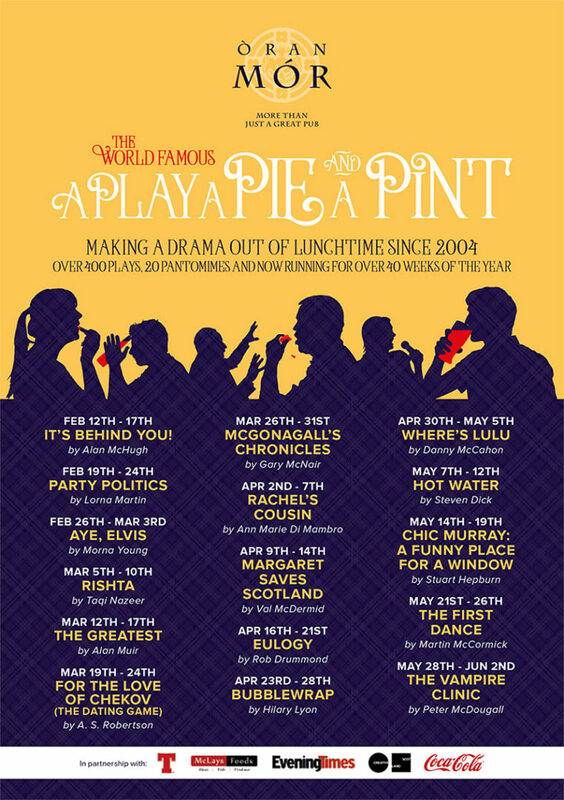 Welcome to our Spring 2018 season of A Play, A Pie and Pint at Òran Mór! Welcome to our Spring season – packed with exciting new work from the best writing talent across Scotland. The 16 world premieres explore such wide ranging subjects as arranged marriages, surprising funeral arrangements and the hidden tensions of a wedding choreographer. A sparkling array of comedy dramas delve into mid-life dating, love in the out-patients, and the trials of a female Elvis impersonator along with fascinating stories from the lives of Chic Murray, Lulu, McGonagall and Mohammad Ali – did he really come to Paisley in 1965?